Anthony Bourdain’s Parts Unknown will air its twelfth and final season this fall. 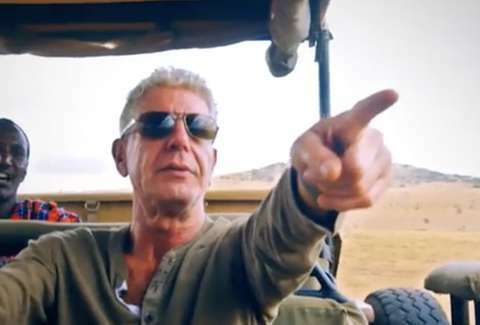 The six-episode run includes the final episode featuring written narration by Bourdain prior to his death by suicide earlier this year at age 61. In advance of the debut later this month, CNN has released an emotional trailer for the final season with comedian W. Kamau Bell, who appears in an episode shot in Kenya with Bourdain. That episode was the final one to feature Bourdain's narration and full involvement in the show. In the trailer, Bell holds back tears as he watches clips from his episode. "He wasn't making TV for TV's sake," Bell says. "He wasn't just doing a job. This was his life's work. "That he brings my name into that, I feel a tremendous responsibility to learn the lesson that I learned when I was with him, to deepen the work that I'm doing, and to prove him right to want me to be on an episode of Parts Unknown." Bell and Bourdain travel through Nairobi eating food and taking in the culture in the episode. “Seventeen f***ing years," Bourdain says sitting on a hilltop with Bell. "As soon as the cameras turn off and the crew will be sitting around, we’ll be having a cocktail, I f***ing pinch myself. I cannot f***ing believe that I get to do this." The final season of Bourdain's beloved show will begin on September 23 at 9pm ET.